Most people think of light in terms of whether it's sunny or cloudy. Sunny means that it's weather for the beach or to spend some time outdoors. Whereas cloudy usually means you need to plan your day, in case the weather turns to rain. Light in relation to photography can be a little more complicated. In fact most people would probably think that the best time for pet photography would be in the middle of the day as it's the brightest time of the day, with the sun at it's peak. 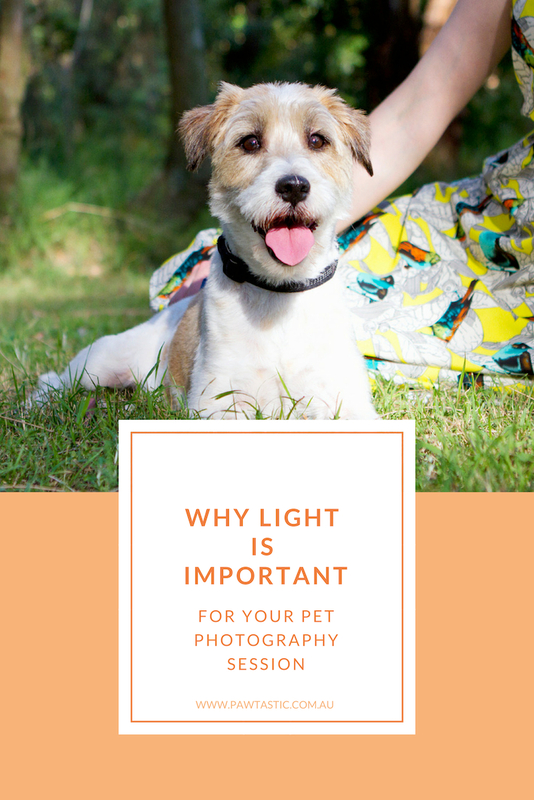 If that's the case, read on to discover when the best time for your pet photography session is and why lighting matters. Have you ever been to a wedding in the middle of the day and wondered why the photographer was using a flash? I mean, surely there's enough light at that time of the day. It couldn't get any brighter, could it? In fact, a photographer has to combat a lot of undesirable elements in the middle of the day. Not least of all, the fact that the lighting isn't great. And they use the flash to even the lighting in their photos. In fact, midday, is the worst time to have your photo taken. Normal people, when standing in the full sun, don't pay much attention to the shadows that it creates. You're probably just thinking about how warm it is, what a nice day it is or how hot you are. And why shouldn’t you? But when you have your portrait taken in the middle of the day, the midday sun produces a lot of hard lines and harsh shadows. Standing in full sun throws harsh shadows across your face and body, which your photographer then has to overcome as you need even lighting on your features otherwise your portraits will look more like an amateur snapshot then a professional image. Then, if you are then turned into direct sunlight to combat the harsh shadows, suddenly your photos are all going to be of you squinting instead. Not exactly, the picture perfect day that you want to remember is it? i) Pets don't always cooperate when you ask them to. I can't ask my models to turn their faces slightly and angle them downwards to compensate for the light. ii) I'm a natural light photographer. This means that I don't use flash to balance out the light and compensate for the sun. Every pet photographer is different in their approach, but I've chosen not to use flash as it can often scare pets and stress them out. Another reason why the middle of the day isn't a good idea for pet photography sessions is because of the heat at that time of the day. Your pets don't have the ability to sweat the same way that humans do, so it's important to make sure that they don't overheat. Keeping them out of the brightest part of the day is the smart option. Not only is it the smartest and safest option for your pet but it's also a good idea to avoid as it will never produce the results you want for your images. A panting, uncomfortable dog doesn't make for a good pet photography subject. And with the safety and comfort of your animals a top priority at Pawtastic, I would never want to do something that could potentially cause problems. Dogs run. Dogs play. Dogs sniff. They investigate, they find new places to explore and they move… constantly. When you have a constantly moving subject, it's a good idea to control the elements that you can. One of these is: lighting. Pet photography sessions with Pawtastic Photography will always take place either early in the morning (just after sunrise) or in the late afternoon (just before sunset). Not only is the day cooler at these times, making it a better experience for your dog. But the light at these time of the days, is beautiful. They next time you're out for a walk at that time of day, take note of the light. If you hold your hand up in front of your face, you'll be able to see that the light casts a soft, golden glow over your skin. The light at these times of the day is a lot softer and warmer, which results in beautiful portraits of your furry companions. Photographers always chase the best light and these are just a few reasons why sessions are held just after sunrise or before sunset. Yes, I am an artist and as such, I want to create art that you love so that you have an incredible experience and get the best possible photos that YOU want for your house. I want my clients 100% happy with their pet photography experience. Are you ready to book your own session? Contact me to get started. ARE YOU STALKING ME ON INSTAGRAM YET?